Are you familiar with the ubiquitous broccoli and cheese casserole? Growing up it was present at every family holiday; and actually it still is. I'm sure there are a million versions floating around, and there's a recipe for this printed in every single church cookbook. Broccoli, cheese, rice, cream-of-something soup.... While its definitely not the healthiest or most gourmet dish, it is super comforting, and it always hits the spot. Our Thanksgiving, Christmas, and Easter tables would feel incomplete without my aunt's contribution. It was always my favorite dish as a child, and it still holds a place in my heart/stomach. I had that casserole in mind when I made this risotto. It's got all the same ingredients, it's just a bit more refined and grown-up. The casserole becomes a risotto, Gruyere cheese replaces the cheddar, and instead of the questionable cream-of-something soup, it gets it's creamy, comforting texture from the arborio rice and melted Gruyere. 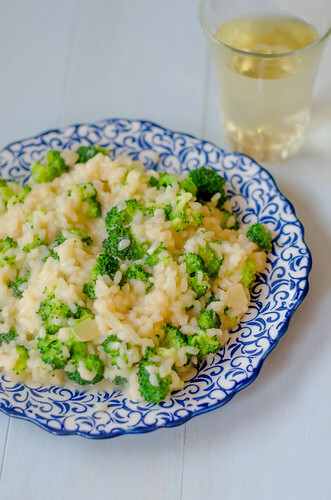 The broccoli retains it's texture and bite since I just quickly steamed it, and the whole thing is still just as comforting, familiar, and delicious as the original casserole. Only it's acceptable ... and even encouraged.. to pair this with a glass of wine. Broccoli and cheese casserole is all grown up. In a large skillet, combine the broccoli florets, a pinch of salt, and water, cover, and bring to a simmer over medium heat. Cover and cook until the broccoli is bright green and just tender, about 5 minutes. Remove from heat, drain the broccoli, and set it aside. Wipe out the skillet and return to the stove over medium heat. Heat the oil, then add the onion and sauté until softened, 3-5 minutes. Add the garlic and 1/2 teaspoon of salt, and cook until the garlic is fragrant but not browned, about 1 minute. Meanwhile, in a medium saucepan, bring the broth to a gentle simmer over medium-low heat. Cover and allow to simmer continuously. Add the arborio rice to the onions and garlic, and stir constantly until the edges of the grains are translucent. Reduce heat to medium-low and stir in the wine, stirring continuously until it's almost absorbed. Working 1-2 ladles at a time, add the broth to the rice, stirring constantly, until almost all the liquid has been absorbed. Continue adding liquid until the rice is cooked to al dente, about 20 minutes total. Taste to check doneness. When cooked to al dente, add 1 more ladle of chicken broth, and remove from heat. Stir in the butter, Gruyere cheese, and steamed broccoli. Taste and season with salt and pepper. Gruyere is my favorite cheese! This sounds awesome! Broccoli and cheese is truly one of the best combinations. :) This sounds like such a comforting dinner for a blustery night! Broccoli and cheese all grown up haha I love it. With Fall around the corner this will be a great comfort meal. I feel like I kind of missed out on this classic staple! I'm not sure I've EVER had one of those broccoli casseroles. And yet...I still know I'd love this stepped up risotto version!